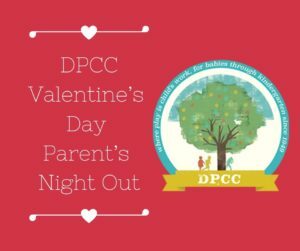 DPCC is hosting a Valentine’s Day Parent’s Night Out. Childcare will be provided at DPCC from 5-8pm. Register your child/children for an evening of babysitting provided by your favorite DPCC teachers and teenage volunteers. Include your child/children’s name and age in the comments section. All current students and their siblings (through 5th grade) are welcome. Click HERE to register or more information.